Back to Florida today (Monday) to fish a great clear water, shallow beach. We fished the outgoing tide and Paulos was soon into a fish (he fished today, until now he has been the ghillie). 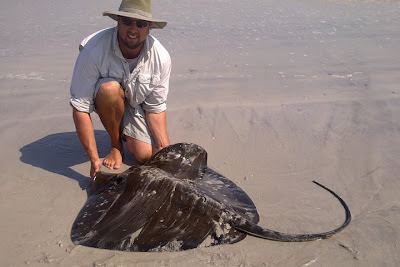 He said he thought it was a stingray - and when he got it in the surf what a stingray! It was about 70lb and angry, wielding it's sting around like an mad axe-man. I wish I'd poured some water over it to wash the sand off. I hit the next run which ran out into the distance, I gradually bullied him back towards shore before he took all the line back. The trick, I've been told, to fighting sharks it to be completely relentless - 'If you're resting, the shark's resting'. I managed to get him in the surf and Paul dragged him onto the beach. 5' 11" about 125lb. Nearly six foot of pure muscle. Next Paul was into a shark and unlike mine this one ran towards the beach and after a relatively short fight I was sent into the surf to drag it to shore. I was standing in 3 feet of water faced with a fairly fresh shark almost as big as me. I managed to grab it's tail and hang on after a few attempts - Paul was back on the beach laughing 'cause he knew how difficult it would be to get hold of. 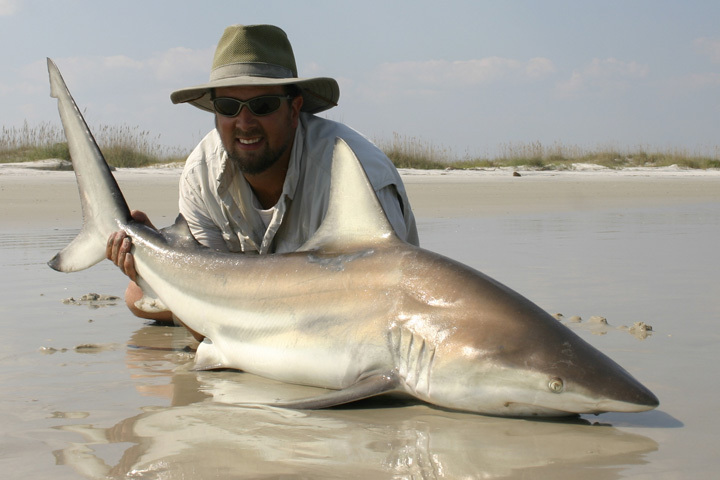 5' 4" blacktip shark, nice to go wading with! As the tide went out we had a number of dropped runs. We also connected with a number of sharks, the problem was; in the shallow water they tend to jump - often spitting the hook in the process or landing on the leader and breaking the line... We had 5 more sharks on between us but failed to land any of them... Lot's of arm ache, and lot's of fun, but no shark photos. One last run as we were packing up resulted in a stingray about 8lb to me. What a great day! 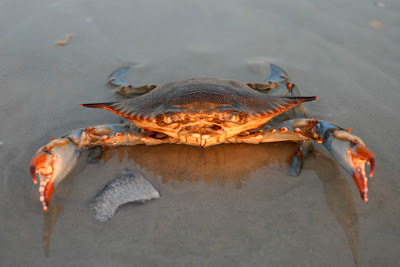 And as we left this angry blue crab waved us goodbye.